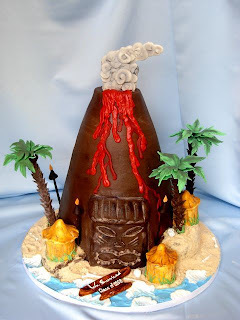 About 3 weeks ago, we received a request from Helen, a cake designer in Virginia who came across our website and really liked our sculpted volcano cake. She asked if she could use Rick’s design for a tribal party graduation cake, and we said that would be fine. Recently we were on a cake community site and saw she had posted a photo of the cake she had made mentioning it was our design. Whoa! Rick and I both took a double take. What incredible similarities! 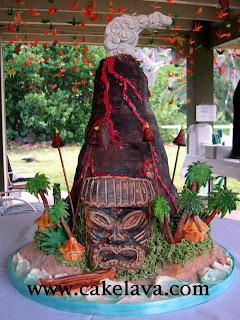 Helen, if you are reading this, you did a terrific job recreating our volcano cake with your own artistic touches. We hope whoever received the cake enjoyed it and you had fun making it! Our sculpted volcano cake which is currently found on cakelava.com in the Celebrations: Sculpted Cakes section was actually made for Gina and Brian's wedding. It’s the second volcano wedding cake we’ve done. It served 80 guests and their flavor was Lemon Pucker.